With fall finally here, you are probably paying more attention to your trees than ever before. While you’re admiring the changing leaves, have you noticed one tree, in particular, doesn’t look as vibrant as the rest? Or perhaps you’re seeing just how close those heavy tree limbs hover over your driveway? 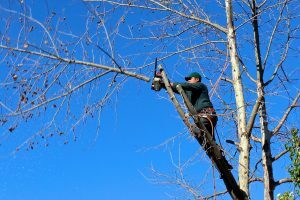 Here at Towle Tree, we’re experienced in NH tree trimming and can tell you exactly what you should do about a questionable tree on your property. Trees infected with disease or overtaken by predatory insects can have dangerous implications. For one, the source of the illness can spread to other plants in the ecosystem and make them sick. It’s best to remove a sickly tree if you can’t get rid of the disease or insect. Additionally, weak trees are more likely to fall in a storm or have branches break off, which can be a safety concern if they are close to your home. Even a perfectly healthy tree could blow over in a windstorm or break under the weight of heavy snow. If a tree branch is overgrown and too close to your home or property, NH tree trimming can trim it back to a safe spot. It may seem counterintuitive, but like your hair, trees need to be trimmed every so often to keep them healthy. It can also help them grow in a direction that promotes better sunlight. Uninhibited growth – letting them go in whichever direction they want – can create crossing branches or limbs that are too heavy. Regular NH tree trimming can ensure healthy growth and make your tree a safe and beautiful addition to your property. If you have trees in your yard, you’re probably pretty conscious of what happens if they get too close. 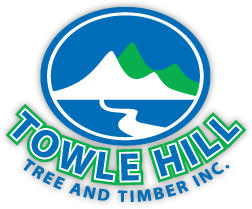 Keep your home safe and your trees healthy with regular tree trimming from the pros here at Towle Hill Tree and Timber. Give us a call at (603) 944-1879 to schedule an appointment.